January 29, 2015 By Allyson 2 Comments This post may contain affiliate links. Read my disclosure policy. Now that we are well into winter, it doesn’t really occur to most people that they should still utilize their grill! I love grilling, no matter what time of the year. One problem I do occasionally run into though, is my hand freezing while grilling! Luckily for me, Kraft has solved this ongoing problem. They recently created a line of custom, over-the-top grilling innovations to help America’s well-known grilling gurus, “Evergrillers,” endure the outdoor elements while grilling year-round. The Evergriller Grill ‘N’ Flip Mitt was created to inspire Evergrillers to develop new winter grilling traditions just in time for the big game. Want your own Evergriller Grill ‘N’ Flip Mitt??!! Make sure you read all the way to the bottom of this post to see how you can win one for yourself (and a year’s supply of Kraft Barbecue Sauce)! 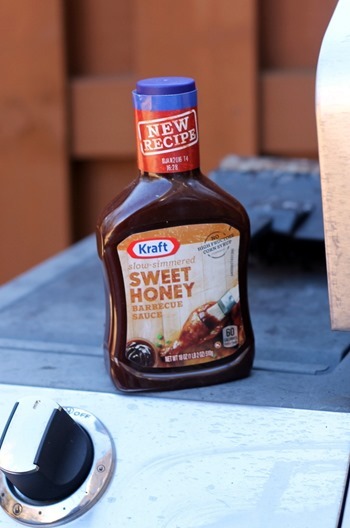 Not only has Kraft come up with this genius idea for grilling, but they have also revamped their New Kraft Barbecue Sauce! It’s available in eight varieties; Original, Hickory Smoke, Sweet Honey, Mesquite Smoke, Sweet Brown Sugar, Sweet & Spicy, Spicy Honey, and Thick & Spicy. 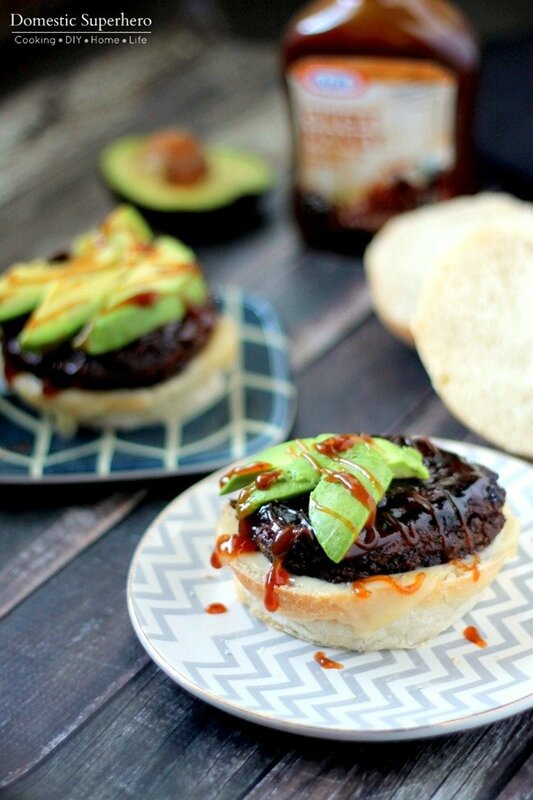 I chose the Sweet Honey Sauce for these Spicy Black Bean Barbecue Avocado Burgers because I wanted to balance out the spicy kick in the burgers, with the sweet honey taste from the Kraft Barbecue Sauce. While I was grilling the burgers, I ended up sliding a piece of foil under them. They are really delicate and sometimes can break apart on the grill rack easily. By adding this foil you prevent that from happening. 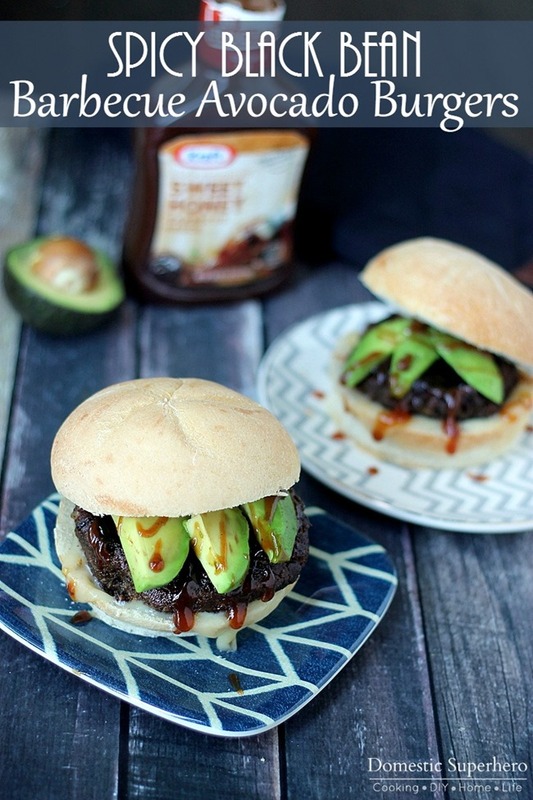 After you are done grilling the black bean burgers, add a few slices of avocado, a slice of pepper jack cheese, and drizzle the Kraft Sweet Honey Barbecue Sauce over the top. Delicious. You can really tell a difference in the New Kraft Barbecue sauces; the sauces feature high-quality ingredients like tomatoes, sweet molasses, cider vinegar and cane sugar. In addition, the sauces have new package design! You have to try them! These burgers are perfect any time of the year. I love mixing up the toppings and trying new sauces and veggies on top. Whether you are a vegetarian or not, this Spicy Black Bean Burger is incredibly tasty and will be enjoyed by all! 1. Put onion, jalapeno and garlic into a food processor and pulse for a few seconds. Add beans, oats, corn, green onion, cumin, curry powder, and cayenne pepper. Season with salt and pepper and pulse for about 20 seconds or until fully mixed. Scrape downs sides of the bowl and process for 10 seconds. 2. Place mixture into a bowl, cover, and refrigerate for at least two hours. 3. Remove chilled mixture from refrigerator and stir in breadcrumbs. Adjust seasonings to taste. 5. Heat grill and spray the grill with non-stick spray. You may use a foil under the burgers if desired (they crumble easily). 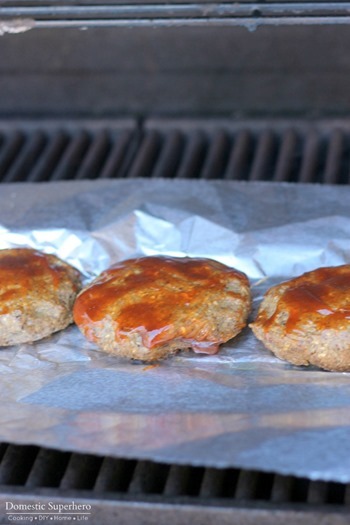 Grill for 5 to 7 minutes on each side or until a crust develops and the patties are heated through. 6. 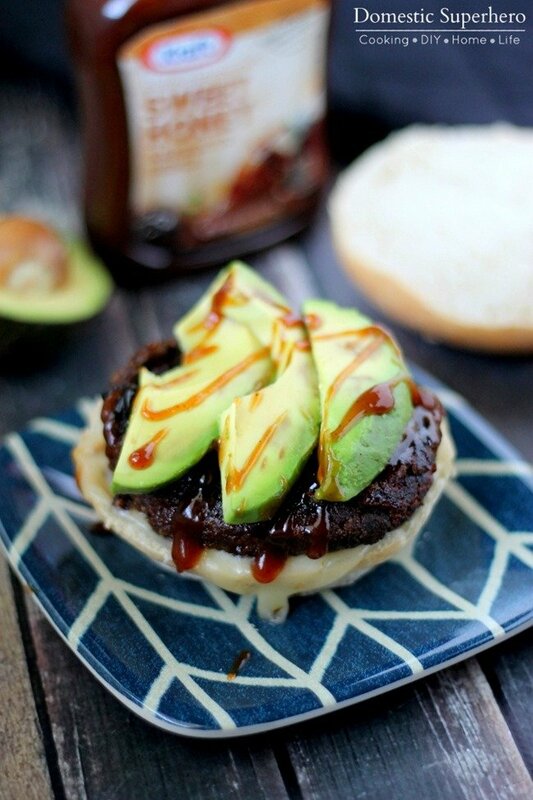 Add 1 TBS barbecue sauce to the bottom bun, then add the cheese slice, burger, avocado slices (about 3 per burger), and remaining 1 TBS of barbecue sauce to the top. Top with remaining bun top. These burgers can also be cooked in a skillet - use a couple TBS of olive oil, heat, and then cook about 4 minutes per side. 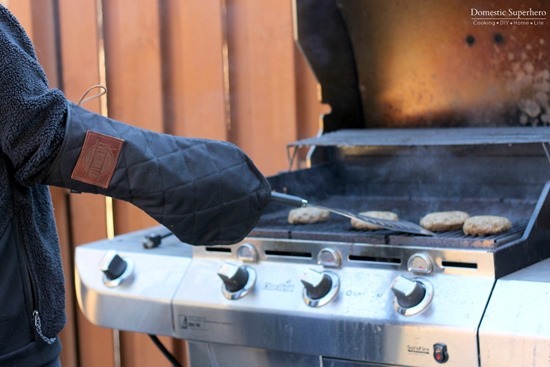 Interested in learning more about the Evergriller Grill ‘N’ Flip Mitt and having one of your own? 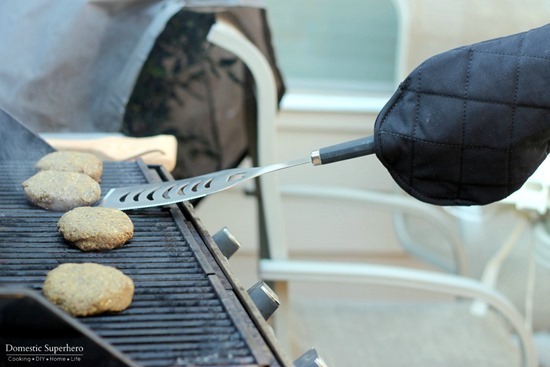 The Evergriller Grill ‘N’ Flip Mitt is a specially designed, fire-resistant grilling glove that protects the griller’s hands from both the heat of the grill and the chill of the outdoors during winter grilling season. The unique design of the top insert can hold many grill tools, making it easy to flip, stab, and baste with ease and precision. Grillers everywhere can enter for a chance to win an Evergriller Grill ‘N’ Flip Mitt of their own and a year’s supply of Kraft Barbecue Sauce!! To enter, grill fans can visit GrillinFools.com between January 19 and January 30. The winner will be randomly selected at the close of the giveaway. What a great combo of ingredients – they look so yummy! Anything with avocado is always a winner in my book! My husband LOVES avocado so these were a huge win for him!